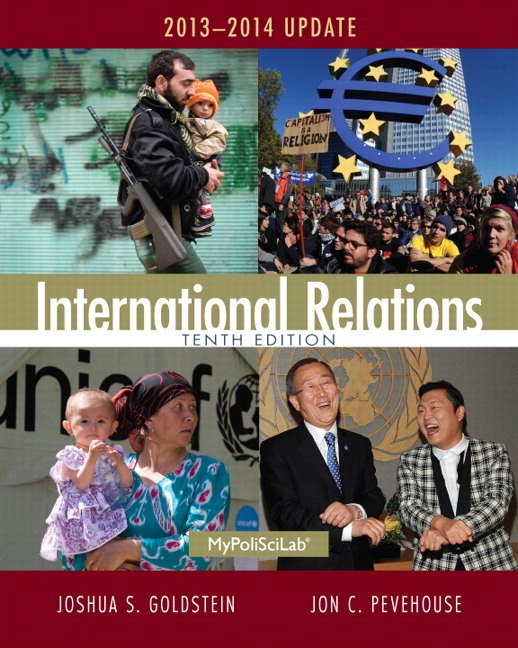 Thoroughly updated to cover world affairs through 2013, International Relations is praised for being the most current and comprehensive introduction to international relations theory, as well as security, economic, and global issues. MyPoliSciLab is an integral part of the Goldstein program. Key learning applications include MyPoliSciLab with simulations and videos. Personalize Learning— MyPoliSciLab is an online homework, tutorial, and assessment program. It helps students prepare for class and instructor gauge individual and class performance. Explore Concepts and Current Events—Includes a balanced survey of security, economic, and transnational issues. Improve Critical Thinking—Feature boxes help students apply international relations theory to current world problems. Engage Students—A four-color design and numerous figures, maps, and photos offer a current and lively reading experience. Emphasize Learning Outcomes—In MyPoliSciLab, study plans based on book-specific learning objectives give students follow-up reading, video, and multimedia activities for further practice. Support Instructors—A full set of supplements, including MyPoliSciLab, provides instructors with all the resources and support they need. MyPoliSciLab—MyPoliSciLab is an online homework, tutorial, and assessment program that truly engages students in learning. It helps students better prepare for class, quizzes, and exams—resulting in better performance in the course. It provides educators a dynamic set of tools for gauging individual and class performance. And, MyPoliSciLab comes from Pearson—your partner in providing the best digital learning experiences. Customizable—MyPoliSciLab is customizable. Instructors choose what students’ course looks like. Homework, applications, and more can easily be turned off and off. Blackboard Single Sign-on—MyPoliSciLab can be used by itself or linked to any course management system. Blackboard single sign-on provides deep linking to all New MyPoliSciLab resources. Pearson eText and Chapter Audio—Like the printed text, students can highlight relevant passages and add notes. The Pearson eText can be accessed through laptops, iPads, and tablets. Download the free Pearson eText app to use on tablets. Students can also listen to their text with the Audio eText. Assignment Calendar & Gradebook—A drag and drop assignment calendar makes assigning and completing work easy. The automatically graded assessment provides instant feedback and flows into the gradebook, which can be used in the MyLab or exported. Personalized Study Plan—Students’ personalized plans promote better critical thinking skills. The study plan organizes students’ study needs into sections, such as Remembering, Understanding, Applying, and Analyzing. Comprehensive coverage of international relations theory – This text offers the widest survey of theoretical perspectives, ranging from realism and liberalism to feminism, peace studies, postmodernism, and constructivism. Balanced emphasis on international security and international political economy – The book equally covers security and economic issues and illustrates how these issues overlap and affect each other. Historical context – To place recent trends in the context of the international system’s evolution in the 20th and 21st centuries, Chapter 1 presents a brief historical survey, and timelines throughout the text provide historical background when needed. “Policy Perspectives” boxes – Ask students to take the perspective of a national leader faced with a real-world situation and to develop a policy in response. These boxes bridge theory and policy and reveal the tradeoffs inherent to decision-making and the connections between foreign and domestic politics. “Let’s Debate the Issue” boxes – Focus on controversies emerging from globalization and invite students to develop a position on them. Placed at each chapter’s end, these boxes help students use the concepts they just read and prepare for active participation in class. “Careers in IR” boxes – Help students see the relevance of and the job possibilities in international relations. Careers covered include positions in nongovernmental organizations, government and diplomacy, international business, and teaching/research. Figures and tables – Help present and clarify quantitative data so students can scrutinize the implications of different theories and policies for themselves. Photos and in-depth captions – provide visual examples of important concepts and current events. Maps – Located throughout the text and in a mini-atlas help students learn basic geography and link politics to places. Integrated study guide – Each chapter concludes with a chapter summary, list of key terms, and critical thinking questions. Supplements – The outstanding supplements packagesupports a wide range of instructional settings, including small discussion groups, large lecture halls, and online or Web-based courses. Create a Custom Text – For enrollments of at least 25, create your own textbook by combining chapters from best-selling Pearson textbooks and/or reading selections in the sequence you want. To begin building your custom text, visit www.pearsoncustomlibrary.com. You may also work with a dedicated Pearson Custom editor to create your ideal text—publishing your own original content or mixing and matching Pearson content. Contact your Pearson Publisher’s Representative to get started. The euro currency, a successful experiment in its first decade, began to look shaky, and further expansion of the EU was put aside. telecommunications continued to revolutionize the global economy, with 6 billion cell phone subscribers worldwide. While militants and governments across the world told their stories on Twitter, Chinese citizens used Twitter-like microblogs to bypass their government and have their say. Deep divisions of governance of the Internet emerged at an international conference in Dubai tasked with developing a new Internet treaty. Tremendous progress has been registered in such areas as fighting measles, cutting maternal deaths, and providing access to safe drinking water. Looming over these positive trends is the threat of global warming, marked by stark warning signs such as freakish weather, floods, and droughts, while the international community proves incapable (at yet another major conference, in South Africa) of coming to grips with the problem. “Seeking the Collective Good” – This new section emphasizes a core theme of the book: the collective goods problem. Each chapter contains an example of a collective good that states are attempting to achieve. Each box then explores how the three core principles laid out in Chapter 1—dominance, reciprocity, or identity—have been used by states in an attempt to supply the collective good. Tables and figures –The tables and figures have been updated with the most recent available data. This includes new data on GDP, military forces, migration and refugees, debt, remittances, foreign aid, the HIV/AIDS epidemic, and UN peacekeeping operations. Photos – This update edition revises the photo program substantially. Dozens of new photos, mostly from 2012 and 2013, draw visual attention to current events while reinforcing key concepts in the text.